I know I haven’t posted in a while. It is not through lack of trying, I’ve just been doing other things! Firstly, I realise that I never said a final thank you to everyone who submitted their thoughts, memories and collections to my project during the completion of my Masters degree in Heritage (Contemporary Practice) at Kingston University. 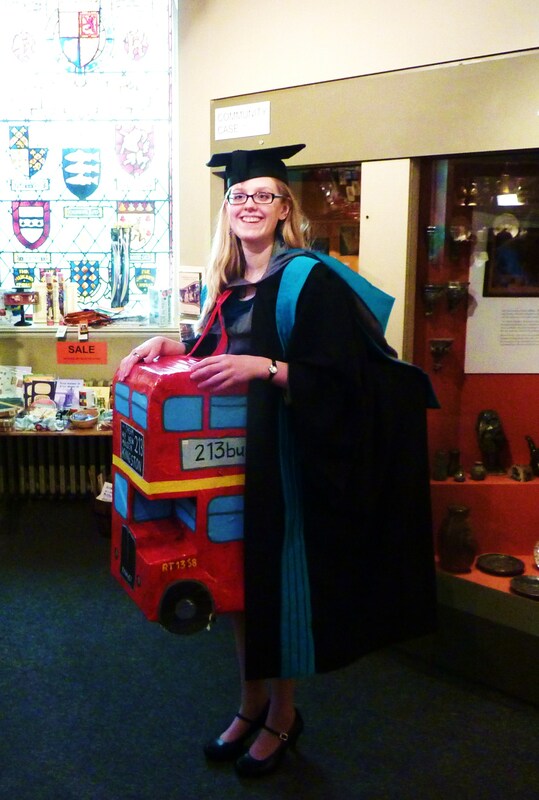 I submitted on September 3rd 2013: my essay (or ‘critical reflection’) which was a sort of academic piece on the project and how I completed it, my bus costume, my collection of bus related material and a project diary/book with essay, blog posts and future proposals inside. Please accept my huge thanks for your contribution big or small, I have felt so privileged to meet/make contact with you and represent the 213 bus and what it means to people who use it. In the end, I received the dissertation prize (though no actual prize!) and got a distinction for my degree so am very happy! Secondly, the reason I have been so busy of late is that my MA degree allowed me to apply for and successfully get the Local History Officer position within the Royal Borough of Kingston upon Thames. I now work full time researching Kingston’s local history and looking after our collection of photos, newspapers, books, leaflets and other ephemera. The good news is that I am now is an enviable position in terms of accessing bus related local history materials, the bad news is that I am exhausted from each day at work and can’t quite motivate myself to stay late to research bus stuff! I hope I will gradually adjust to the new timetable and would like to be a bit more consistent in posting from now on. Thanks for reading, keep your thoughts, memories and questions coming! Hi Amy, slightly random I know but I was wondering if you’d rent out your bus costume? It is amazing and it would be perfect for an event that I will need to attend. Understand a lot of time and effort was put into and I’m very reliable and would take good care of it. Can sign papers ensuring that and all. If so, please write. Can do – the problem is it is cardboard and getting rather bashed and bruised I’m afraid! Also, it is pretty much me sized so it may not fit. Where is the event and how could we proceed? I’m based in South West London.